The Prophet and Teacher Of Healing. Brother Branham as he is popularly known and called among the congregation he founded grew up to be a mighty man of God. At about 38 years old, he was praying in a small trapping cabin just north of his home in Jeffersonville, Indiana. It was then, late into the night, that the Angel of the Lord visited him and gave him the commission to pray for the sick. 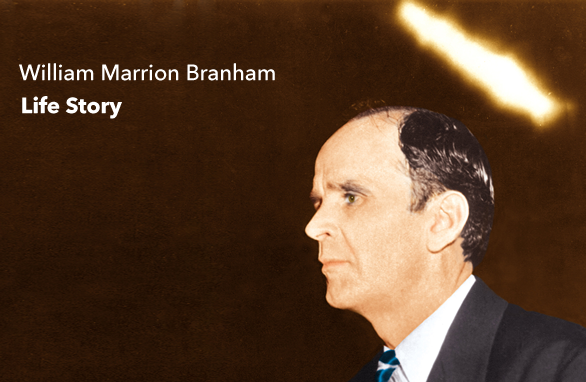 William Marrion Branham was born April 6, 1909 in Kentucky near Burksville. His parents were extremely poor farmers. As Branham got older they moved to Jeffersonville, Indiana. They were so poor he did not have a shirt to wear to school and he would wear a winter coat inside so he would not have to expose his poverty. 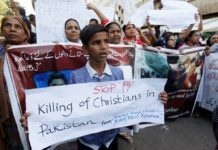 He had no religious training, but at an early age heard a voice say to him “Do not drink or smoke or defile your body in any way, for when you get older I’ll have a work for you to do.” This so terrified the boy he ran away as fast as he could. Branham did not have a grid for what had happened to him, but tried to obey what he’d heard. He continued to struggle with God, and when his brother Edward died he began to seek Him. Still it wasn’t until he became seriously ill that he turned his life around. He believed he was about to die. While he was in the hospital he heard the same voice that had spoken to him in his childhood. It repeated the same thing three times ‘I called you and you would not go.’ He told God “if you let me live I’ll preach the gospel”. He felt somewhat better that day. After he got out of the hospital he began to seek a church that would lead him to repentance. He found a disciples church that believed in the baptism of the Spirit and anointing with oil. They prayed for him and he was instantly healed. He was on fire from that point on. For six months he cried out to receive the baptism of the Holy Spirit. One day God’s presence came upon him in a mighty way. He felt God called him to preach the gospel and pray for the sick. He was 24 years old and he began holding tent meetings and doing what God had asked him to do. He saw many people converted. In 1933 he also saw a series of visions that spoke about the coming years including the rise of Nazism, Facism, and Communism. With his ministry now rolling, he built an independent Baptist church in Jeffersonville, Indiana. These were happy years for Braham. He married and had two children. During this time he became interested in the Pentecostal message, which was still highly controversial at that time. He attended a Pentecostal convention, and was asked to join them as a traveling evangelist. He believed that this was God, but was talked out of it by friends who thought it too controversial. He turned them down. Everything seemed to go wrong for him from that point on. His church began to fail and his wife and daughter were killed in the Ohio River flood of 1937. He believed he was under judgement from God for not doing what he was called to do. Branham struggled over the next several years. He worked as a game warden, and a logger, and sometimes preached. He married his second wife Meda, and eventually had three more children. One day he went off to pray by himself to see if could find out God’s heart for him. He repented of his choice to not go with the Pentecostals. On May 7, 1946 he had a visitation from an angel of God. The angel said he was a seer prophet and would have two distinct signs in his life. The first was that he would be able to detect illness in people, and the second was that he would see sins in their life they needed to repent of. Branham started his healing ministry immediately after this visitation. He started in St. Louis and then went to Texas, Louisiana, Florida, California, and eventually all over the United States. In 1948 Branham was visited by Jack Moore, a pastor out of Shreveport, Louisiana. He was so impressed he took Branham to several churches across the United States. When Moore had to return to his home church he contacted Gordon Lindsay, who took over as Branham’s campaign manager. The meetings were so dramatic that Moore, Lindsay, and Branham began the magazine and organization named “The Voice of Healing” which was headquartered in Shreveport, Louisiana. The original purpose was to report on Branham meetings, although it later expanded to include many other healing evangelists. On one campaign trip in Florida F.F. Bosworth, who had an extensive healing ministry of his own, joined the organization to support Branham’s ministry. These meetings kicked off the healing revival that began in 1947 and continued through the 1950s. 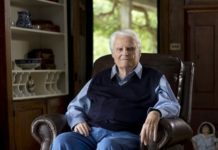 Although he was the first, and most wel-known, several other healing evangelists were also raised up including A.A. Allen, Jack Coe, and Oral Roberts. Branham said himself that “Deaf, dumb, blind, all manners of diseases have been healed, and thousands of testimonies are on record to date. I do not have any power of my own to do this… God always has something or someone to work through, and I am only an instrument used by Him.” The most famous healing in the history of the healing revival was when William Branham prayed for US Congressman William Upshaw from California. Upshaw had been crippled in a farming accident as a youth and was healed when Branham prayed for him. Branham eventually took international trips to Canada, Mexico, Europe, Africa, Finland, Australia, and India. In the mid 1950’s things began to go wrong for Branham. He had run his organization in a loose manner and felt God would take care of everything. In 1955 Branham started having financial problems. He was not having the same success in his meetings and was having trouble covering his expenses. The California Campaign put him $15,000 in debt. Others were called on to help make up the differences. The IRS began a review of his finances and found he had never kept good records of the money that flowed in and out of his ministry. He was not keeping an extravagant lifestyle. In fact he lived an extremely simple life. Branham just didn’t track where the money went. The outcome was an IRS settlement where Branham owed the government a staggering $40,000 in back taxes. By 1957 it was clear that God was taking his hand off the healing movement. Branham was exhausted and refused to do large meetings anymore. He was surrounding himself with supporters who began to control who was allowed to see him and who wasn’t. Some of his teachings were very unusual and by the 60s even considered heretical. Gordon Lindsay was warned by Kenneth Hagin that the Lord was going to take Branham home because Branham was gettng into false doctrine. Gordon Lindsay attempted to see Branham a month before he died, but was refused access to Branham by the men around him. Some of those same men were suggesting that he was Elijah the prophet heralding the end times. Lindsay believed Branham was falling into the same delusion that took John Alexander Dowie and wrote that in the Voice of Healing magazine. People who knew Branham say that he never made the Elijah claim on his own. Things were definitely out of balance in Branham’s life. He ministered primarily in Arizona for the Full Gospel Businessman’s Association in the winters the last few years of his life to support his family. In 1964 Branham had a vision where he was riding tired into the sunset. He understood that God was warning him that he would die soon. In 1965, while driving to Tucson, Arizona Branham’s car was struck by a drunk driver. He lived a few day longer and then died on Christmas Eve, 1965. A couple of years before his death he asked his dear friend Jack Moore and his daughter Anna Jeanne to write his biography. He warned them that there would be a lot of confusion that would come in about his life after he died. Unfortunately they did not have the time to do what he asked, and confusion did come in. Some people created a religious group around Branham’s teachings, becoming referred to as Branhamites. Others wrote him off as a heretic. Branham was, and continues to be, a highly controversial figure in the healing movement. The best known book written about Branham is Gordon Lindsay’s “A Man Sent From God“, which was published in the 1950’s at the height of his fame and influence. This excerpt from Pastor Pearry Green’s book—”The Acts of the Prophet”—will give you a glimpse of the nature of William Branham’s life and ministry. Brother Green was a friend and associate of Brother Branham, particularly in the latter years of his life. This rich little book was made up of a series of messages preached by Pastor Green in his own tabernacle then compiled and put into print. On April 6, l909, a fifteen—year-old Kentucky mother gave birth to a baby boy. They named him William Marrion Branham, and on the day that he was born there was a strange aura, a presence, in the rustic little log cabin. A Light came whirling in through the window and hung over the crib. No wonder the people who saw it said, “What manner of child shall this be?” When the baby was but six months old, God’s protection over him was demonstrated for the first time. He and his mother, stranded in the cabin while his father was away on a job, were miraculously saved from certain death. A great snow storm had isolated the cabin. Food and firewood ran out, so the young mother simply wrapped herself and her baby in all the bedclothes they had and went to bed, waiting for the end. A neighbor a little way off, by some strange phenomenon that he couldn’t explain, had for several days felt attracted to visit the little cabin to see how his neighbors were doing. One day the urge came upon him so strong that he was not able to resist it: he crossed the hills to the cabin and found the mother and child nearly perished. Quickly he gathered firewood and built a fire, made a trip back to his home for nourishment, and nursed them back to health. Thus only by a strange Presence that the man could not explain, was he drawn to come at this hour and save the life of this particular six-month-old boy. At the age of three, Brother Branham received his first vision. From the vision, he knew to tell his mother that though they now lived in Kentucky, some day they would live near a city called New Albany. It was not long after, that the family moved from Kentucky across the Ohio river to Indiana and a little later moved further south to Jeffersonville, Indiana, which is just a few miles from New Albany, Indiana. The vision was fulfilled. At the age of seven, Brother Branham had another strange experience that he was unable to understand. It happened one day that, while assisting his father, he found himself passing underneath a poplar tree about the size of a barrel and a voice spoke from it saying, “Never smoke, drink, nor defile your body, for when you are older there is a work for you to do.” He couldn’t understand the mysterious event; it frightened him, and he ran to his mother. She first thought he had been snake bitten, then thought that he may just have been in nervous shock, so she put him to bed and called the doctor. At the age of nine, one day while he was playing with friends he saw a vision of a bridge. This bridge was to extend across the Ohio River from Louisville to Jeffersonville. He told his friends that he could see the bridge and to his horror, he saw a portion of it collapse, carrying sixteen men to their deaths. His friends told this around the community and twenty two years later that bridge was built at the cost of the lives of sixteen men. The bridge stands today, between Jeffersonville and Louisville. Once as a young man, a girl made fun of him because he wouldn’t smoke, and he actually tried to smoke to stop her derision. His testimony is that as he reached for the cigarette he heard the whirlwind again, and the more he tried, the stronger it became, until its rushing sound frightened him. Because of this Brother Branham never did smoke. Another time a man offered him a drink in the presence of young William Branham’s father, and insisted that he take it. He was about to take the drink, because his own father called him a sissy, when the whirlwind came again. He could hear it rushing, and as he continued to put the bottle toward his lips, the wind became stronger until It frightened him and he ran off. He did not disobey God—he could not—for God had a plan for his life which He was bringing to pass. As a teenager, he once went to a carnival, and there a fortune teller, an astrologer, walked up to him and said, “Young man, did you know that there is a sign following you?” How similar to the time when the evil spirit said to Jesus, “We know who you are, thou art the Christ, the Son of God.” The priests and the religious leaders, the most religious people in the world at the time of Christ, didn’t recognize Him, the evil spirits did. When the apostle Paul went to Thyatira to preach, he was not welcomed, but put in stocks, and a young sorceress said, “This is Paul, who preaches Christ unto us, the Message of salvation.” There was an evil spirit in her that recognized who Paul was when the others sought to persecute him. So it was in this generation. The evil spirits could recognize there was something different about Brother Branham before the religious people of the world would admit it. Brother Branham almost died for the second time at the age of fourteen. Accidentally shot, lying in his own blood with part of his leg shot away where the blast of a shotgun had struck him, he had a vision, or experience, where he himself faded away and he saw people in hell. He saw things that were to take place among the women of the world in the 1960’s, the grotesque use of makeup and the like. These women were in hell and it shocked him to realize that there was such a place, yet he resisted the call of God upon his life, though God continued through the years to deal with him, for there was a work for him to do when he was older. He came west to Phoenix Arizona, in 1927, at the age of nineteen. It was while there, working on a ranch, that he received word of the death of his brother Edward, who was closest to him in age. When he heard of Edward’s death, he stood and looked out across the desert, and asked himself whether Edward had been ready to meet God. Then, as he made the journey back to Jeffersonville to the funeral, the question came to him, “Are you ready?” He recalled how his father and mother wept and the great impact this made on his life as he began to wonder about himself. He was ever aware of this Voice, this Presence that he had experienced since he was a baby, wishing to speak to him. It separated him from the other boys his age, preventing their friendship because he spoke of strange things and wouldn’t smoke, drink, dance, or run around as they did. He couldn’t pattern his life after theirs, yet he didn’t know how to surrender himself to God. But through the death of Edward, the Spirit of God continued to be with him and brought him to where he actually tried to pray. He didn’t know how, but loving the wilderness, he wrote on a piece of paper, “God, help me!” He left the note stuck on a tree because he knew that God was there in nature. Finally the day arrived when he went to a place, knelt down, and though he still did not know how to pray, cried out in simplicity. That was enough to open the windows of heaven and he said it seemed like a thousand pound load lifted off his shoulders. With no other way to express his extreme joy and relief, he stood to his feet and began to leap and run about. He ran into the house and his puzzled mother asked him what was wrong. “I don’t know,” he replied, “I just feel so light!” He ran out of the house and down the road, using the only way he knew to express his elation. Later while working for the public service company, he was exposed to some gas and was poisoned, and became very ill. An operation was performed during which he almost left this life again. The situation was grave until a supernatural event took place as a Light came and hung before him. The doctors didn’t expect him to live and when he did survive, one of the doctors came to his room after the operation and said, “Truly, God has visited this boy!” Brother Branham said that at the time he didn’t know what was happening, but that if he had known then what he learned later, he would have leaped from the bed rejoicing, healed in the Name of the Lord. After he left the hospital, he sought a deeper experience with God, because he realized that God had done a great thing for him. On another occasion, as he knelt in a woodshed to pray, a Light came in and formed a cross. It was then that something swept over him and he experienced an exquisite feeling he had never known before. He once told me personally that it felt like rain was pelting down on his body. Later he heard of a group of people who believed in the laying on of hands for healing, and at their church meeting, somebody laid hands upon him and he was instantly healed of a stomach problem that remained from the gas exposure.